DETROIT -- The defending Super Bowl champion Baltimore Ravens moved a step closer toward having a shot at defending their title. Tucker's franchise-record 61-yard field goal with 38 seconds left lifted Baltimore to an 18-16 win over the Detroit Lions in a Monday night matchup with major playoff implications. Ravens rookie safety Matt Elam sealed the victory with an interception -- Matthew Stafford's third of the night. Stafford threw a 14-yard touchdown pass to Joseph Fauria with 2:21 left, putting Detroit ahead 16-15. 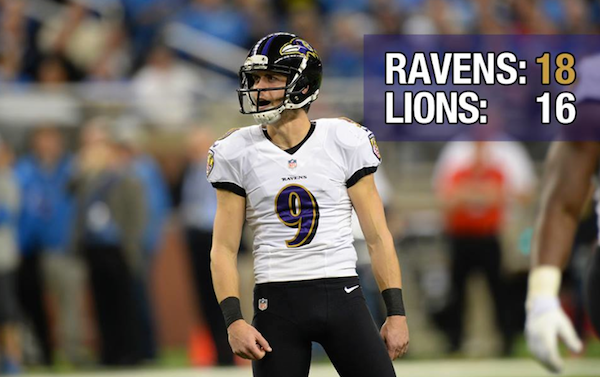 But the Lions were unable to make a 2-point conversion and couldn't prevent Baltimore from setting up its sensational kicker for his sixth field goal of the game and 33rd in a row. Tucker's kick went just inside the right upright and barely had enough distance, eight days after Denver's Matt Prater broke the NFL record with a 64-yard field goal. "Didn't get all of it, got enough of it," Tucker said. "Just glad to get out of here with a victory at a time when the team needed one." Tucker, who hasn't missed a field goal since he was 0 for 2 in Week 2 at Cleveland, has the NFL's longest streak since Matt Stover made 36 in a row for the Ravens from 2005-06, according to STATS. Stafford's three interceptions followed a troubling trend for the franchise. He has 12 interceptions in his last five games. Not coincidentally, the Lions have been able to overcome those miscues well enough to win only one game during the slump. Joe Flacco, meanwhile, didn't turn the ball over and made enough subtle moves in and around the pocket to get sacked only once. He has been sacked a career-high 42 times this season, but he stayed upright enough to move the ball into position for Tucker's big kick. Calvin Johnson dropped a pass that would've converted a third-and-15 deep in Ravens territory to force the Lions to punt for the first of four times before halftime. On the ensuing drive, Tucker kicked his first of three field goals in the first half -- two of which were set up by penalties against Detroit. Tucker's next field goal was set up by a pass-interference call against safety Don Carey. Johnson couldn't catch another pass in Baltimore territory thrown at him late in the first half. The Ravens took advantage of that mistake and one by Detroit's defense on the next drive. Flacco threw an up-for-grabs pass on third-and-8 from the Lions 44 after avoiding a sack, and the incomplete pass was negated by Louis Delmas' helmet-to-helmet hit on Marlon Brown with 16 seconds left in the first half. That flag put the Ravens 15 yards closer to Tucker's field goal that gave Baltimore a 9-7 lead at halftime. Baltimore went ahead 12-7 on the next drive on Tucker's 49-yard field goal midway through the third quarter. The Lions scored on the ensuing drive -- on David Akers' 40-yard kick -- for the first time since the opening minutes of the game. The field goal came after Stafford's pass into the end zone fell incomplete. A replay showed Detroit receiver Kris Durham had his arm held on the play by Lardarius Webb, but there was no penalty flag for pass interference. Tucker's 53-yard field goal -- matching his previous season high -- put the Ravens ahead 15-10 with 8:06 left.